Opera Neon Web Browser is concept browser by Opera. It is the newly released advanced web browser by Opera. This browser is featuring advanced features empowering the modern web browsing experience. 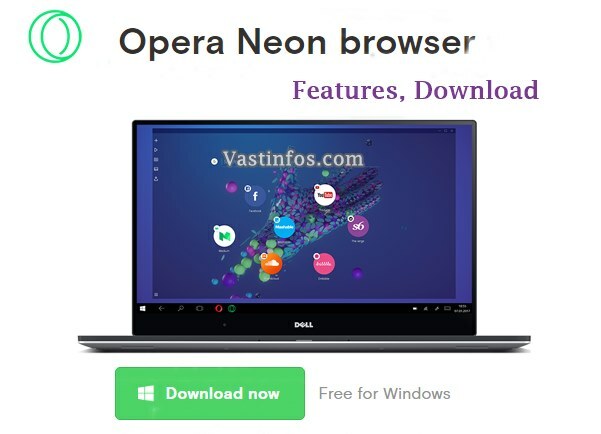 Opera says Neon is an alternative reality for Opera browser. Opera Neon is made possible from Chromium open source project and other open source projects. The existing Opera browser is rebooted with advanced UI features like better and fresh style of speed dials, omnibox, multi tabs. You can bring the desktop wallpaper to the browser. Or Opera offers a set of awesome wallpapers. Easily controllable tabs for multitasking with smooth experience in switching. It offers something more than a usual experience of as a window to the internet. Video PopOut – It provides a solution to play video or music without changing the tabs. Gallery Tool – Snapped images can be pushed to the gallery and reusable by dragging and dropping. It helps to browse multiple web pages simultaneously in a single tab by splitting the tab as left, right. Web pages can be dragged and dropped tot he split tabs. Opera Neon Web Browser comes up with new advanced features empowering the browsing experience. It improves the web browsing with better and faster tools. New cool UI features are looking awesome. Features like snap to the gallery are time-saving tools for bloggers, social media users etc. It helps to chat and browse in the same tab by splitting the tab. It helps to chat and browse in the same tab by splitting the tab. Also offers quick and easy music, video playing tools for making mind free.